The articles published in this issue of Law and Contemporary Problems examine the effects of different sentencing reforms across the world. 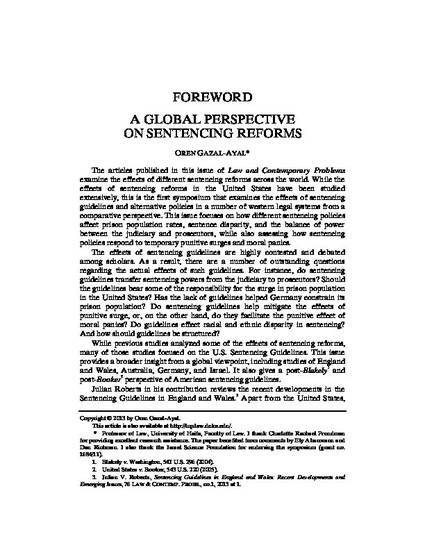 While the effects of sentencing reforms in the United States have been studied extensively, this is the first symposium that examines the effects of sentencing guidelines and alternative policies in a number of western legal systems from a comparative perspective. This issue focuses on how different sentencing policies affect prison population rates, sentence disparity, and the balance of power between the judiciary and prosecutors, while also assessing how sentencing policies respond to temporary punitive surges and moral panics. The effects of sentencing guidelines are highly contested and debated among scholars. As a result, there are a number of outstanding questions regarding the actual effects of such guidelines. For instance, do sentencing guidelines transfer sentencing powers from the judiciary to prosecutors? Should the guidelines bear some of the responsibility for the surge in prison population in the United States? Has the lack of guidelines helped Germany constrain its prison population? Do sentencing guidelines help mitigate the effects of punitive surge, or, on the other hand, do they facilitate the punitive effect of moral panics? Do guidelines effect racial and ethnic disparity in sentencing? And how should guidelines be structured?